Insulating your floorboards can help to reduce your energy bills and ensure that your home stays warm and draught free. Most people insulate the ground floor of their property because this is where you’ll feel the cold. You can also insulate an upper floor if it isn’t above a space that has no heating such as a garage or a porch. Read on for more information about whether to insulate your floor as well as the method, costs and advantages involved. Do I Need to Insulate My Floor? Your floors can lose around 15% of the heat in your home and so by insulating them you can save on average around £60 a year. The work will pay for itself within two or three years depending on whether you do the job yourself or get a professional insulation company to do it for you. How Can I Tell What Type of Floor I’ve Got? It’s likely that if your house was built before the 1930s you will have a suspended timber floor with joists and floorboards. One way you can tell is if you have air bricks on the outside of your house. Another way is by simply lifting the carpet to see if you have floorboards. If you have flooring which you are unable to look underneath, there is still another alternative if you have a basement. Go down into the basement and look up to see if you have wooden joists with floorboards above them. If your house was built after the 1930s then it will probably have a solid floor and you’ll be able to see this by lifting a piece of carpet in the corner of a room. Again, if you go down to the basement, the absence of joists will indicate you have a solid floor. If the ceiling has been covered with plasterboard a small section will need to be removed in order to confirm whether there are joists present or not. What Are the Different Types of Floor Insulation? There are different types of floor insulation for solid and suspended floors. Suspended floors tend to lose more heat than solid floors. However, a solid floor does still lose heat and it can be very beneficial to insulate it. If you don’t have a basement then you will need to lift the floorboards to lay the insulation. You can use a soft material like mineral or sheep’s wool to insulate between the joists and then add wood fibre boards to keep everything in place. If you have a basement, the insulation can be installed between the joists and then battens can then be put underneath the joists to add more insulation. This can be kept in place with netting. It is essential to make sure that any holes that have been caused by old or existing pipework or cables are sealed to prevent draughts getting through. If you are insulating an existing concrete floor, then insulation can be added over the top of the floor. If the solid floor is being removed or the project is a new build then it is possible to insulate beneath the solid floor. Don’t forget that if you apply insulation over the top of your floor, it may be necessary to adjust the doors and any floor level electrical sockets. The best material to use for over floor insulation is foam boards because they are easier to lay, and you don’t need a great deal of thickness to achieve the right amount of insulation. Before you place the foam boards on the floor a damp proof membrane will need to be laid to protect the floor from moisture penetration. Underfloor insulation should begin with the layer of sand insulation with a damp proof membrane installed on top. After this stage is completed, insulation boards can then be laid, and the new concrete poured on top. Can I Install Floor Insulation Myself? Insulating a wooden floor can be taken on by anyone with some DIY experience. All the materials you need are available at DIY stores and the sales staff should be able to help you if you have any questions. The work is simpler than dealing with a solid floor because it doesn’t involve other work such as adjusting doors and re-positioning electrical sockets. If you are not confident enough to take on this job yourself, then get a professional who will know exactly what type of materials would be best suited for a satisfactory insulation. 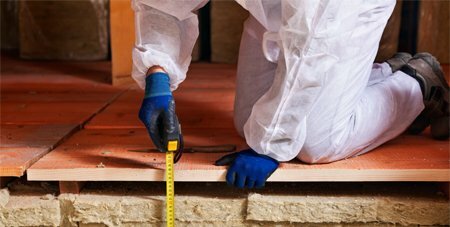 How Much Does Installing Insulation Cost? If you install the insulation yourself, the costs will obviously less because of the saving you make on professional labour charges. You can insulate a suspended timber floor in an average sized room for around £100. If the job is undertaken by a professional, it will probably cost at least double this amount. If you are having a solid floor installed by a professional, the cost will normally start at around £900 for an average sized room. Blanket (batts and rolls) are the cheapest with foam boards being the most expensive. If you want an environmentally friendly option, then go for sheep’s wool which is 100% natural. It’s soft and light, it absorbs water and it won’t cause any irritation to your throat or your skin when you are installing it. Is There a Guarantee if You Have the Work Carried Out Professionally? Normally if you are dealing with a reputable company they will offer you a warranty of around ten years, but warranties do vary from company to company.